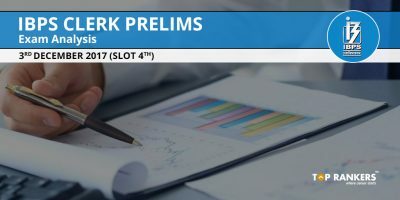 IBPS Clerk Prelims Questions Asked 9th December 2017 – Find the questions asked section-wise in IBPS Clerk Prelims 9th December 2017. The third day of IBPS Clerk Prelims exam concluded now. 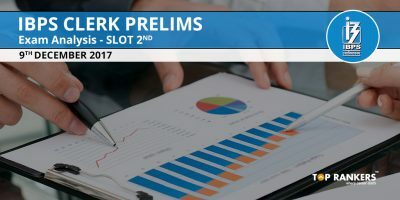 And if you are yet to give the exam, you can benefit from this post by taking a look at the IBPS Clerk Prelims Questions Asked 9th December 2017. The exam will be conducted for different batches separately in four different shifts. There’s only one more day pending for the exam – 10th December 2017. There’s a total number of 7883 vacancies in 19 banks across India. Let us see some other information like important dates and exam pattern first. 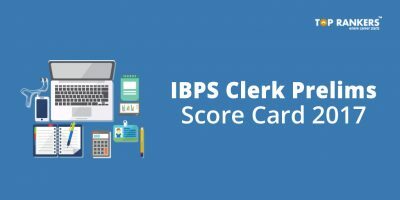 To start your preparation for IBPS Clerk Mains exam, click on the link given below. 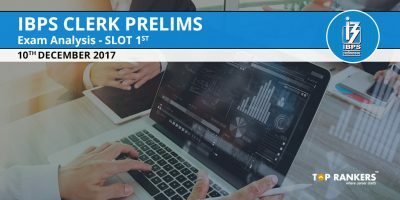 To take our IBPS Clerk Sure Shot Mock Tests based on the exact 2nd and 3rd December 2017 exam pattern, click below. Double Filler – Two blanks were present in a sentence & you have to fit the correct words in the banks. Phrase & Idioms – You have to replace the highlighted part of the sentence with the appropriate Phrase or Idioms. 3) 7.5, 9, 13.5, 27, 67.5, ? 4) 4, 2.5, 3.5, 9, 40, ? 5) 4.5, 3.5, 6, 17, 67, ? 8) 46% of 600+ 44% of 225=? 12) Two years hence the average age of A and B is 37. Three years ago the age of B is 36. If C is 11 years older than A then, find the sum of present ages of A and C? 13) A and B invest Rs. 116000 and 144000 respectively. B invests for 6 months. At the end of the year, B’s share 9000 find the overall profit? 14). Length and speed of the train A is 170m and 20 m/s respectively. Length of the train B is 180m both running at opposite direction and time taken by the trains to cross each other is 10sec. Find speed B’s speed. 16). A person’s present age is two-fifth of the age of his mother. After 8 years, he will be one-half of the age of his mother. How old is the mother at present? 17). A boat running upstream takes 8 hours 48 minutes to cover a certain distance, while it takes 4 hours to cover the same distance running downstream. What is the ratio between the speed of the boat and speed of the water current respectively? 18). A sum of Rs. 725 is lent in the beginning of a year at a certain rate of interest. After 8 months, a sum of Rs. 362.50 more is lent but at the rate twice the former. At the end of the year, Rs. 33.50 is earned as interest from both the loans. What was the original rate of interest? 19). The salaries A, B, C are in the ratio 2 : 3: 5. If the increments of 15%, 10% and 20% are allowed respectively in their salaries, then what will be new ratio of their salaries? 20). A is 10 km to the north of B. C is 5 Km to the east of B. D is 2.5 Km to the north of C. E is north-west of point C and west of point D. Find the distance between point E & A. 21). A can do a work in 36 days & B is 20% more efficient than A. If A started working and worked for 8 days and left then in how many days will B do the remaining work? 22). A invests 9600 and B invests X Rs. B leaves after 6 months. Total profit earned is 4600. A’s share is 3400. Find how much did B invest. 23). A vessel contains a mixture of milk and water in the ratio 6:1. 7 liters of the mixture is taken out and replaced with 3 liters of water. The content of water is now 14.5% of the total mixture. Find the original content of water. 24). A can do a work in 24 days. He worked alone for 15 days and then B joined and they finished the work in 5 days. In how many days can B alone do the work. Linear Arrangement – 12 People were sitting in two parallel rows. Those sitting in row 1 facing North & those sitting in row 2 facing to the south. Floor Puzzle – Based on 8 floors. *We’ll update the other slots as soon as we get the info. 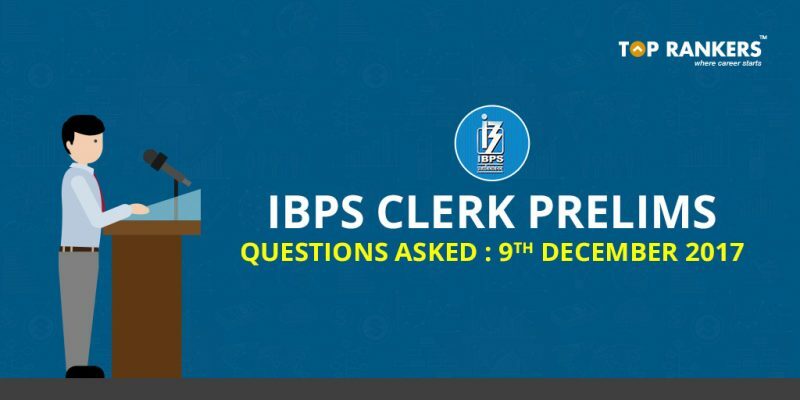 So, tell us, did you find our post on IBPS Clerk Prelims Questions Asked 9th December 2017 (All Shifts) helpful? Then, keep visiting us regularly for more exam-related updates.